Fine Arts Center Blog: Vieux Farka Touré in Concert at the FAC! 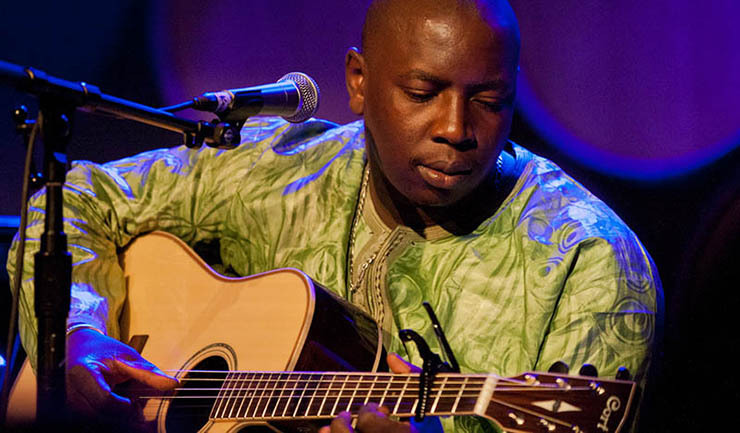 The Colorado Springs Fine Arts Center and KRCC have partnered to bring award-winning Malian guitarist and vocalist Vieux Farka Touré to the FAC's SaGaJi Theatre for a special concert! Often referred to as “The Hendrix of the Sahara”, Vieux Farka Touré was born in Niafunké, Mali in 1981. He is the son of legendary Malian guitar player Ali Farka Touré, who died in 2006. Ali Farka Touré came from a historical tribe of soldiers, and defied his parents in becoming a musician. When Vieux was in his teens, he declared that he also wanted to be a musician. His father dissaproved due to the pressures he had experienced being a musician. Rather, he wanted Vieux to become a soldier. But with help from family friend the kora maestro Toumani Diabaté, Vieux eventually convinced his father to give him his blessing to become a musician shortly before Ali passed. "His live performances are highly energized and Vieux is known for dazzling crowds with his speed and dexterity on the guitar, as well as his palpable charisma and luminous smile, both of which captivate audiences from all audiences in spite of any language barriers"
On this first album, Vieux pays homage to his father and follows Ali’s musical tradition, giving new versions of the West African music that is echoed in the American blues.On his second record, Fondo on Six Degrees (2009), Vieux branched out and presented his own sound: while remaining true to the roots of his father’s music he uses elements of rock, Latin music, and other African influences. The album received a great deal of critical acclaim from across the globe, and Vieux was clearly moving out of his father’s shadow. You can learn more about Vieux Farka Touré's journey on his website! "Vieux Farka Touré has clearly established himself as one of the world’s rare musical talents and guitar virtuosos with a distinct style that always pays homage to the past while looking towards the future"
Monday, Aug. 5 | 7p | Buy Tickets!